Luxury 4-star-family hotel with 92 rooms incl. 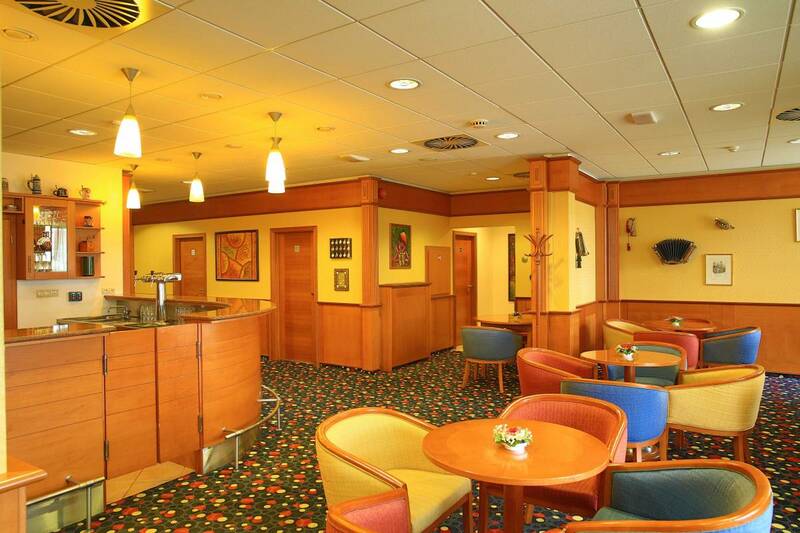 suites and apartments and a large conference centre in a quiet part of Pilsen, not far from the city centre (only 5-min-way by car; the bus stop of the public transport just in front of the hotel) and only 1 min-way from the exit of the highway D5 direction Prag – Nuremberk and the shopping centre Olympia with a multi-cinema. The hotel has got a beautiful view to the countryside and the river valley. It was built in 2006, is new and modern and guests appreciate the cleanness, friendly atmosphere, excellent cuisine, a big car park for 180 cars and 3 buses. Restaurant with an open-air summer terrace, wine restaurant and café. The advantage of the hotel is a modern congress centre – the hotel has got a multi-purpose hall for up to 280 people and four lounges. All area with WiFi and air-conditioning free of charge. Standard First Class Single/Double/Twin/Triple „Queen Size“ Bed 210x100 cm, 25 sqm, Free WIFI, Air-con, Minibar (empty, shop at the reception 24 hrs), LCD TV, Direct dial phone, Safe; Bathroom with Bath tub combinated with Shower, Toilet, Bidet, Hair dryer. Some rooms with a balcony. All rooms are quiet (all windows and walls are anti-noise). Some rooms with the street view and some with the view of the countryside and the Uhlava river valley. Voltage 230V, 50 Hz. Double room – possible as double or twin. Triple room – 3rd Bed Standard Size 190x100 cm. Superior First Class Single/Double/Twin/Triple „Queen Size“ Bed 210x100 cm, 25 sqm, Free WIFI, Air-con, Minibar (empty, shop at the reception 24 hrs), LCD TV, Satellite programmes. Direct dial phone, Safe; Bathroom with Bath tub combinated with Shower, Toilet, Bidet, Hair dryer. Some rooms with a balcony. 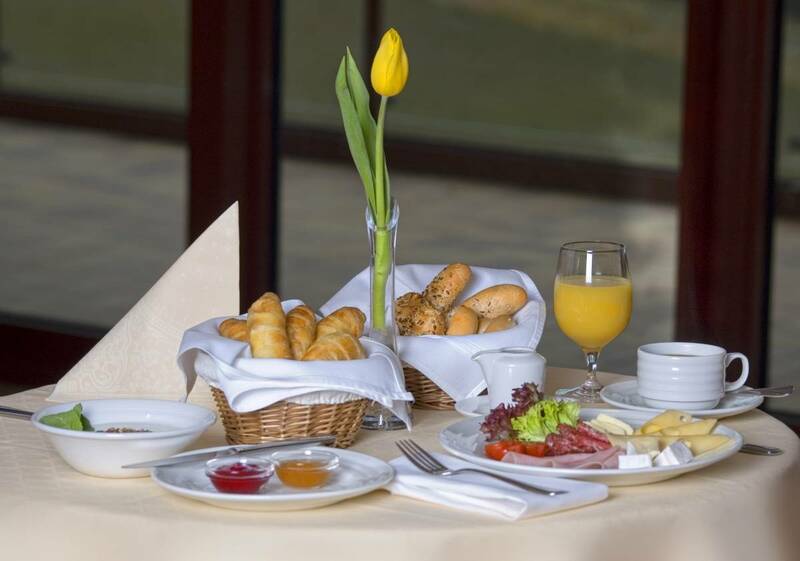 All rooms on higher floors, with the view of the countryside and the Uhlava river valley. Voltage 230V, 50 Hz. 2 rooms (Single/Double/Twin/ for disabled people. Double room – possible as double or twin. Triple room – 3rd Bed „Standard Size“ 190x100 cm. Suite 1 Bedroom with 2x „Queen Size“ Bed 210x100 cm (possible as double or twin) + 1 living room with a sofa + 2x Bathroom, in total 50 sqm; both rooms equipped with Free WIFI, Air-con, Minibar (empty, shop at the reception 24 hrs), LCD TV, Satellite programmes, Direct dial phone, Safe; Bathrooms with Bath tub combinated with Shower, Toilet, Bidet, Hair dryer. Balcony and view of the countryside and the Uhlava river valley. Voltage 230V, 50 Hz. Max. occupancy 2 adults. Family suite junior 1 Bedroom with 2x „Queen Size“ Bed 210x100 cm (possible as double or twin) + 1 living room with a sofa (double bed for max. 2 children), 2x Bathroom, in total 50 sqm; Both rooms equipped with Free WIFI, Air-con, Minibar (empty, shop at the reception 24 hrs), LCD TV, Satellite programmes, Direct dial phone, Safe; Bathrooms equipped with Bath tub combinated with Shower, Toilet, Bidet, Hair dryer. Balcony and view of the countryside and the Uhlava river valley. Voltage 230V, 50 Hz. Max. occupancy 2 adults + 2 children max. 5 years old. Apartment 2x Bedroom each with 2x „Queen Size“ Beds 210x100 cm (possible as double or twin), 2x Bathroom, 50 sqm. Both rooms equipped with Free WIFI, Air-con, Minibar (empty, shop at the reception 24 hrs), LCD TV, Satellite programmes, Direct dial phone, Safe; Bathrooms equipped with Bath tub combinated with Shower, Toilet, Bidet, Hair dryer. View of the countryside and the Uhlava river valley. Voltage 230V, 50 Hz. Max. occupancy 4 adults. motorway D5, direction from Nuremberg and Vienna – exit 76 – information signs Plzen-Cernice, then Plzen-Centrum /Plzen /Plzen-Centrum over 3 roundabouts to the Nepomucka street. The hotel is situated behind the crossing on the left side. motorway D5, direction from Prague – exit 73 – information signs Plzen-Cernice, then Plzen-Slovany /Plzen-Brucna /Brucna along the Barvinkova street to the Nepomucka street. The hotel is situated behind the crossing on the left side. Individual reservation which is confirmed in writting can be cancelled in writting,any cancellation fees 24 hours and more before the arrival ( at the latest till 1 p.m. local time). By cancellation of a reservation in shorter time than 24 hours is a client obligated make payment for cancellation fees for one night, if it will not be agreed before otherwise. We require credit card details as a guarantee of the reservation. 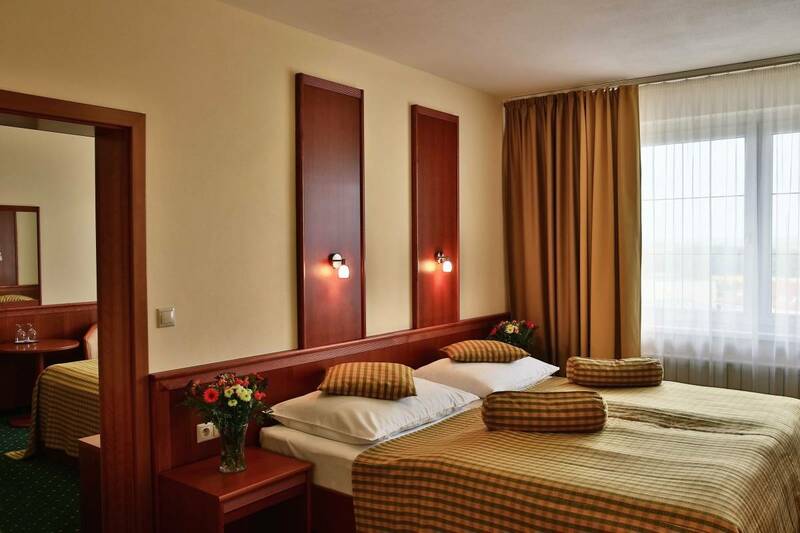 The PRIMAVERA Hotel & Congress centre is located in a quiet but still central part of Pilsen called Brucna not far from the centre of the city. There is parking space for 180 cars and 3 buses-free in the hotel area for FREE! Shopping centre Olympia with multicinema Cinestar – 1km from the hotel, near by the D5 motorway exit . There is a beautiful view of the river valley Úhlava and Radyne castle.